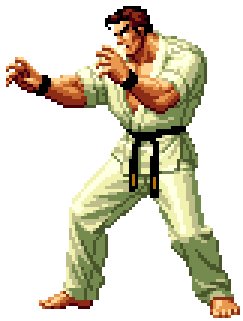 Takuma Sakazaki (タクマ・サカザキ) is the most established known Kyokugenryu Karate practitioner and the father of Ryo Sakazaki as well as Yuri Sakazaki. His distinguishing feature is an X-shaped scar on his right pectoral. Takuma led Ryo Sakazaski and Robert Garcia as a team in the new King of Fighters for two years, until he retired and brought in Yuri Sakazaki as a replacement. He reappeared again at KOF 98 as part of the Oyaji Team (Father Team), but this appearance is not considered canonial. This page was last edited on 10 February 2018, at 16:40.